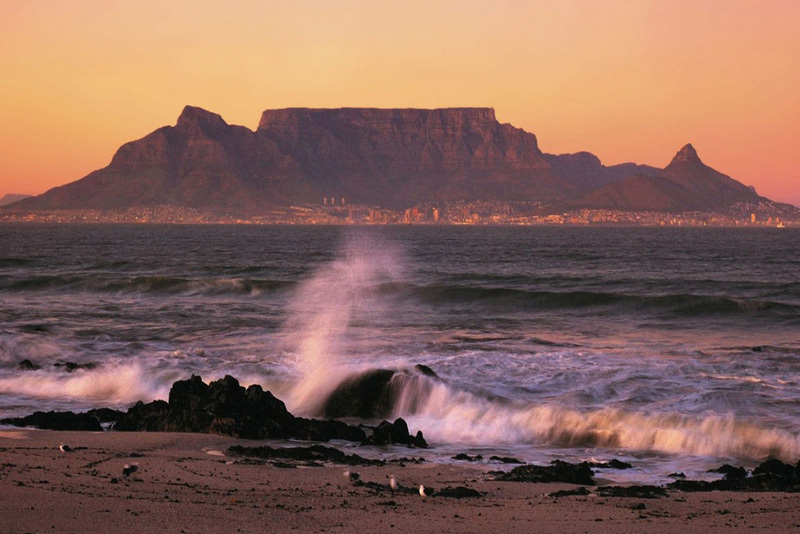 Table Mountain, with Lion’s Head on one side and Devil’s Peak on the other, is located in the middle of Cape Town. It often has a waterfall of clouds pouring off the front of it, otherwise known as the “table cloth,” and basically looks like something out of a fairy tale. For the brave it’s about a 2-hour hike to the top, or there is a relatively inexpensive cable car that will take you both ways. There is a restaurant and cafe but it’s much more fun to pack a picnic (and wine)! Lion’s head is a 45-minute hike and also offers amazing views. something for everyone, from laid back hookah spots to Irish bars to posh clubs. More on the best places to go out later. Robben Island is the site of the prison where Nelson Mandela was incarcerated for 27 years. The tour is led by former prisoners and is extremely inspirational, especially to hear about how Mandela and other anti-apartheid leaders led their movement and educated themselves in secret while they were imprisoned. The District 6 Museum is one of the best museums I have ever been to. In 1965 an area of Cape Town known as District 6 was declared “white” by the government, and all the residents were forced to move to townships outside of the city. The museum has walls of photos and mementos like books, mirrors and furniture. It’s like stepping back in time to see how these people lived, and is wonderfully put together. It is a perfect way for people who usually aren’t crazy about museums to get an idea of how apartheid affected these people’s lives. 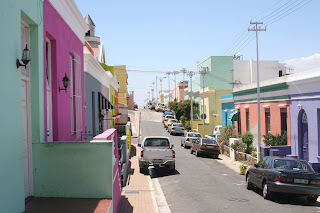 Bo-Kaap in the Muslim quarter of Cape Town, and is one of my favorite parts of town. 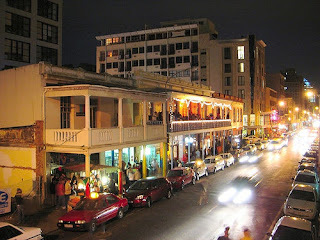 It is full of bright shops and houses and has a little museum on the history of the “cape coloreds,” which in South Africa is not a racist term but applies to anyone of mixed race in South Africa. The colored community has its own culture and history separate from either blacks or whites in South Africa. They also have their own type of food – Cape Malay – which is spicy and incorporates a lot of rice and meat. I would suggest the “Noon Gun Restaurant,” which has amazing views, food and is right near a cannon that goes off every day at noon, hence the name. highlight. Boulder’s Beach is completely overrun with penguins, most who which have become almost tame because of all the tourists that come to see them. You can sit right near them to marvel at how ridiculous it is to see a zillion penguins hanging out on an African beach. 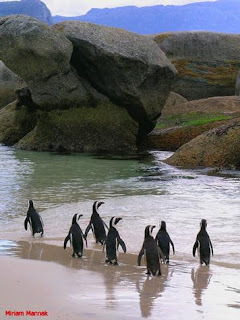 Cape Point is right near Simon’s Town so it is possible to do both places in a day trip. Pack a picnic lunch but don’t share with the baboons in the area. This is located at the end of Table Mountain and has stunning views of mountains and the ocean. Mzoli’s, located in the township Gugulethu, is basically a giant braai and party rolled into one. (Braai being the South African term for barbeque). Go for the atmosphere, street meat and taste of township culture, and if you are feeling really adventurous order a “smiley” – a grilled sheep’s head! Cape Town’s waterfront houses a huge mall with both international brands and local independent shops, but I personally prefer Long Street and the African markets for less touristy shopping. Head through the mall, however, and you come out on the harbor, which is packed with restaurants and bars. The seafood here is world-famous, fresh, and relatively inexpensive, so go with an appetite! About a ten minute drive from Cape Town you hit Clifton and Camp’s Bay, two beautiful sunning areas. Clifton is a little swankier and is actually four separate beaches. The best restaurant nearby is La Med, which has picnic tables, ocean views, fabulous people and an outside bar. Camp’s Bay is slightly further and is one giant beach right next to an awesome strip of restaurants, bars and shops, and is a great place to go and hang out for the day if laying on the sand the whole time isn’t your cup of tea. This is definitely the most posh area in Cape Town, and people really dress to impress at these venues. During the summer Tuesday and Sunday nights are popping.